Derbyshire has a wealth of experience when it comes to industry, this including the various mill complexes, canal and railway lines. Many of which are still in use today. This showing the fine workmanship and craftsmanship that Derbyshire prides itself in. The Derwent Valley was the birthplace of the factory system, where water power was first successfully used for textile production. The stunning scenery of rural Derbyshire can be found extraordinary. This also includes historic mill buildings, the water courses that powered them and the homes built for the workers. The mill owners also provided other facilities such as schools and places of worship, which resulted in the creation of the first modern industrial communities. All of this history which started the revolution of industry in Derbyshire is within a 15 mile stretch of the river valley. Running 24km through the centre of the county from The Masson Mills in Matlock Bath to The Silk Mill at Derby. The site contains a fascinating series of mill complexes, the watercourses that powered them and the settlements developed for the workers. Amongst the site's most significant buildings are: The Silk Mill in Derby where water power was first used for silk throwing machines, the mills at Darley Abbey and Belper which represent the first developments in fire proof building methods and the mill complexes at Cromford and Masson Mills constructed by Richard Arkwright. The site offers a wide choice of walks, which run the full 15 miles of the Derwent Valley . 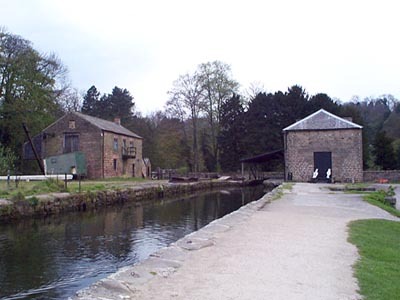 A particularly stunning stretch runs along the Cromford Canal (past Cromford Mill as pictured right) past the Leawood Pumphouse and High Peak Junction Workshops, which offer further attractions. The Edwardian River Gardens at Belper are also definitely worth seeing and is perfect for all ages. The Cromford and High Peak Railway completed in 1831 was to transport minerals and goods between the Cromford Canal and the Peak Forest Canal. A canal was proposed for the route, but the steepness of the hills made this impossible. The railway was powered by horses and stationary steam engines and it took around two days to complete the 30 mile trip. Authorised by Parliament in 1825, its engineer William Jessop's son estimated a cost of £164,000, which proved to be a serious underestimate. Its function was to provide a shorter route for Derbyshire coal than the Trent and Mersey Canal, but it figured largely in early East Midlands railway schemes because it was seen as offering a path into Manchester from London. It was leased by the London and North Western Railway in 1860, being taken over in 1887. In 1833 steam locomotives were introduced on the tracks but only on the very steap sections, horses were still used for another 30 years. 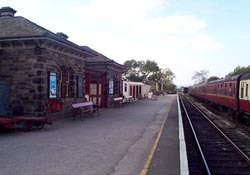 A passenger service was put into place on the line between 1874 and 1877 with only one train running each way per day. The whole of the railway lines were fully closed in spring 1967. In 1971 the Peak Park Planning Board and Derbyshire County Council bought the track bed and turned it into the High Peak Trail, popular with walkers, cyclists and horse riders. In its heyday in the 1930s this railway line (opened in 1899) was deservedly popular with walkers and ramblers, because it runs near to Dovedale. It also for a time carried a through-service for passengers from Euston to Buxton. However it closed in the early 1950s. The Cromford Canal ran 14.5 miles from Cromford to the Erewash Canal in Derbyshire. The canal obtained its act of parliament in 1789 and opened in 1794. The canal, despite costing twice the estimate (£42,697) was a success. The canal mostly carried coal, lead and iron ore. The canal also carried limestone from the Butterley Company's quarry at Crich. In attempt to avoid using cable-haulage or a rack and pinion system, a remarkable steam engine, the "Steam Horse" was tried out in 1813. In 1831 the Cromford and High Peak Railway was built to connect to the canal. In 1840 when the North Midland Railway was built, George Stephenson was faced with the problem at Bullbridge of taking the line over the road but under the canal, thus the Bullbridge Aqueduct, the river, road, railway and canal are at four different sea levels. Most of the canal was abandoned in 1944 with the exception of a half-mile stretch to Langley Mill which was abandoned in 1962. Some attempts are being made to restore the canal and about 5 miles of it is in shallow water.